One Stop Family Pop Up: BOOGIE at Boogie On The Boulevard ! BOOGIE at Boogie On The Boulevard ! We set up a tent for our information table and pin making workshop. We displayed two big signs that explained our project/history and how to participate in the project. With the Peek-a-boo, we explained how the world changed when we were pregnant, and asked participants to see the world as a pregnant woman to gain empathy. Many young men and women, and even elderly men, tried the belly sculpture that weighed 20-lbs; the water bottles inside the sculpture simulated the average belly of a pregnant woman. Make Your Own Pin Workshop, 2 ¼” button. 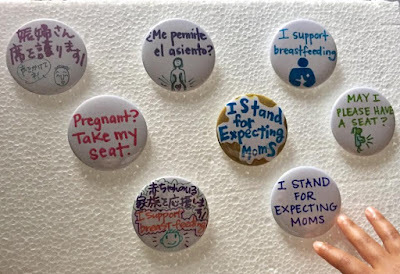 After trying the interactive sculpture, participants wrote their commitment to support pregnant women and new parents in their own languages, and then created their own pins on-site. At the pilot event we held, 50 people participated in the pin making workshop in four hours. Participants took their pins with them to display on their bags or person while in public to show their ongoing support for pregnant women and families.